What kind of pictures do you like in your picture books? Do you like pictures that are big and bold (and just right for storytime)? Or maybe detailed pictures, the kind that tempt you to look more closely? Or do you prefer the realism of photographic art? Whether you're reading picture books because you have kids or because you work with kids (or just ‘cause you like ‘em! ), understanding the appeals of picture book illustrations will help you find books with the right look. Use the tips and tools below to get started! Appeals: would you look at that? All of the terms in italics above are illustration appeals you can use in NoveList to help you (and your patrons) find just-right picture books for every taste and occasion. To help you get a feel for how illustrations appeals work, I suggest that you download our appeal booklet, browse our illustration appeals, and then look up a few familiar picture books in NoveList to see how illustration appeals are used. For instance, when I look at the appeals on books from my favorite illustrators -- Christian Robinson, Yuyi Morales, Rafael López, LeUyen Pham, Melissa Sweet -- I can see that colorful is clearly my top illustration appeal. If you look at your favorites (or the favorites of the kids in your life), do you see any recurring appeals? If so, those should offer a reliable starting point in your search for finding more picture books to enjoy -- for yourself or for patrons. Get into the swing of searching by illustration appeal with the example searches below, or create your own appeal mix. You can learn more about creating searches like this and what GX and AP stand for in our tools to learn about field code searching. If you’re not interested in field code searching, you can recreate these searching with the choices on the advanced search page. Now that you know all about illustration appeals, you're ready to help patrons -- and to empower them to help themselves. 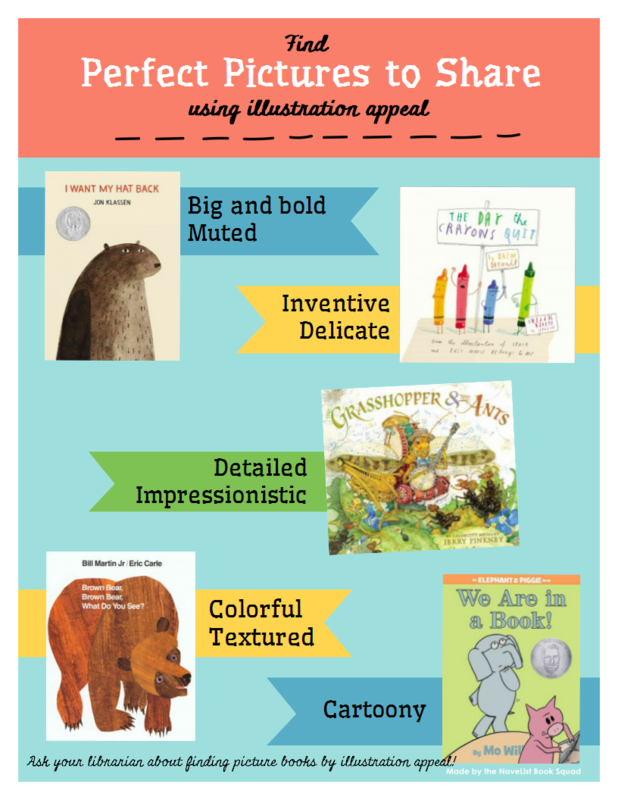 For a simple, self-directed introduction to illustration appeals, create a display of popular picture books and pair it with this flyer, which shows the appeals of a few well-known illustrators. Most of NoveList's illustration appeals describe the quality or style of artwork in a book, but you can also use a review search (field code: RV) to find picture books illustrated with specific types of media. Try the example search strings below and see what you find! 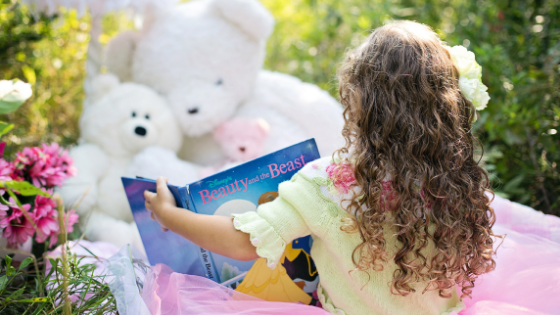 NoveList tracks more than one thousand book awards, including awards just for picture books. Browsing through lists of award-winners in NoveList is a good way to discover illustrations that have been deemed excellent by committees of book professionals. You may want to start with the Caldecott Medal (U.S.), the Marilyn Baillie Picture Book Award (Canada), the Children's Book Council of Australia Picture Book of the Year (Australia), or the Kate Greenaway Medal (U.K.). To browse or search NoveList by Award, click on "Browse By" in NoveList's upper menu bar, then select "Award Winners." From there, you can pick a popular award, look at awards by genre or age group, and browse or search all awards. GX "Picture books for children" AND GX "Stories without words"
If any of the tips above are useful to you, consider subscribing to KidLit Connection from the NoveList Book Squad--it's a free source of children's readers' advisory support delivered directly to your email. 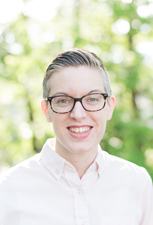 Rebecca Honeycutt is a Readers' Advisory Librarian at NoveList and member of the NoveList Book Squad. ** We welcome your feedback on the above article. Please note that all comments will be reviewed by the moderator. Comments with offensive language or otherwise deemed inappropriate by the moderator will not be published. Thank you.